Polyethylene is a very versatile group of materials with excellent toughness even at very low temperatures. Polypropylene is a hard, stiff, easily workable material with excellent toughness at room temperature. Design Flow has over 40 years of combined expertise in plastic product design and manufacture. hey are moulded from a special grade of UV-stabilised polyethylene, which is designed for long outdoor life. Design Flow Pty Ltd is an Australian privately owned company established in 2001. We specialise in the development, manufacture, marketing and distribution of innovative plastic products under the MatrixTM brand. Our products are sold around Australia and overseas to the retail hardware, building, industrial, mining, marine and primary production sectors. Our products are pided into three main groups: Matrix Screening & Fencing, Matrix Flooring and Matrix Panels. Click here to visit our Screening, Fencing and Flooring Products web site. 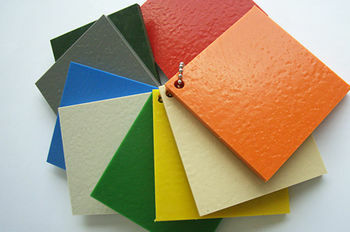 Matrix Panels are 2.4m x 1.2m plastic sheets manufactured in Australia from either virgin or recycled PolyEthylene (PE) and PolyPropylene (PP) thermoplastic resins in any thickness from 6mm to 65mm, in smooth or textured finish and in a range of colours. Design Flow is the only company in Australia that manufactures thick plastic sheets locally - all other major suppliers are importers. Common thicknesses are available ex-stock in black HDPE, but if we don't have what you need in our warehouse, our lead times times from order to delivery are very short - we are usually able to deliver within 1 week. Because we manufacture Matrix Panels in Australia, we can produce custom combinations of sheet thickness, material and colour (minimum order quantities apply - please contact us for a quote). 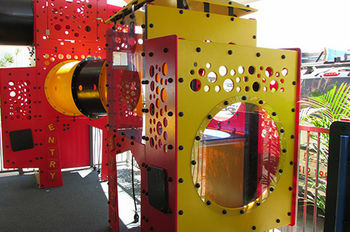 We can also manufacture Matrix Panels to order in ABS and Polystyrene. Unlike timber based sheets or panels, Matrix Panels are tough, strong & durable, will not rot, crack, swell, delaminate, mildew or be affected by termites. Matrix panels can withstand continuous contact with fresh and salt water and most corrosive chemicals that would corrode or destroy timber or metal. Black and coloured materials are UV stabilised for long outdoor life. Natural materials are not UV stabilised and should not be used outdoors for extended periods. Matrix Panels are 100% solid plastic sheets, they are not foamed like some other plastic panels. 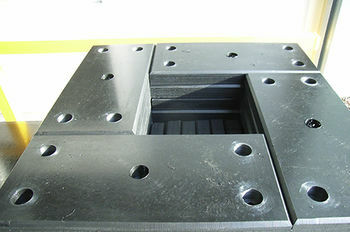 This makes Matrix Panels much stronger and better suited to machining and heat welding using specialized plastic welding equipment, especially for use in manufacture of liquid tanks, pipeline components and other demanding applications. The consistent properties of Matrix Panels throughout the thickness of the sheet make them ideal for cutting and machining into various shapes. Matrix Panels can be sawn, routed, drilled and machined using standard equipment and tools made for timber. The cut edges will look the same as the faces of the sheet. Standard sheet size tolerance is 2400+40/-0mm x 1200+20/-0mm, sheet squareness tolerance is within 5mm. Sheet thickness tolerance is ±5% or +/-1mm, whichever is greater. Sheet thickness can vary within one sheet and between sheets. Coefficient of linear thermal expansion of HDPE is 0.12mm / m / degree C.
A 2.4m long sheet will change in length by about 12mm over a 40 degree temperature change and its 1.2m width will change by 6mm. The fixing holes in the sheet have to be oversized or elongated to allow the sheet to expand and contract freely with changes in temperature. Do not over-tighten the fasteners as this will restrict movement and will cause the sheet to buckle. Do not position fasteners closer than 15mm from the edge of the sheet and ensure that there is a sufficient gap all around the fastener in the hole. If the edge of the sheet breaks away at the fastener hole in the cold, then the hole was too small or there was not enough gap around the fastener. If using one 2.4x1.2m sheet, leave a 6mm expansion gap all around between the edge of the sheet and any fixed object. If multiple sheets are installed side by side, leave a 12mm expansion gap between sheets. If the sheet buckles in the heat, loosen or reposition the fasteners or enlarge the holes in the sheet. Matrix Panels can be used for a huge range of applications in many industries including Agriculture, Aquaculture, Building & Construction, Chemical, Equine, Manufacturing, Marine, Materials Handling, Signage, Transport, etc. Click on the Applications link at left or go to the Polyethylene and Polypropylene pages for more information.